The following is a brief recap of the Tues., Dec. 20, 2016, BPS101 Regular Board Meeting. View the agenda and all supporting documents from this meeting and minutes from previous meetings. 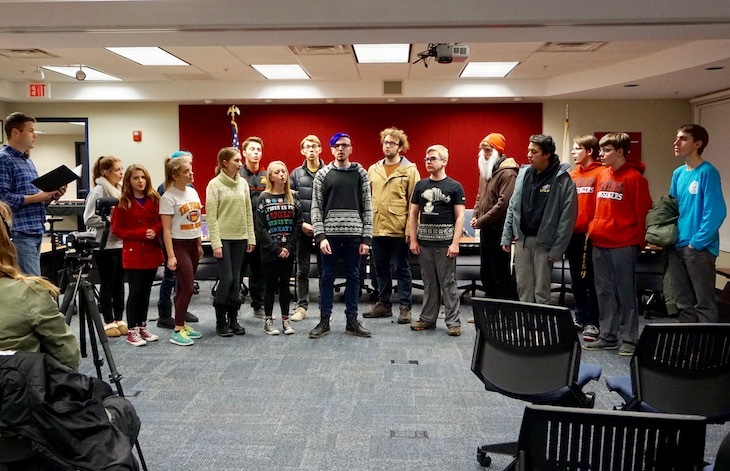 Fifteen minutes prior to the Board Meeting starting, the Batavia High School a cappella group, “Chromatics,” greeted guests with holiday carols. The Chromatics were formed in February 2016 by Batavia High School Choir Director Peter Barsch as a way for students in the BHS Choir to perform in the community more often. The Chromatics recently performed on the “Big John and Ray” show on WLS890 AM and will be performing at the Batavia Fine Arts Centre on Feb. 28. 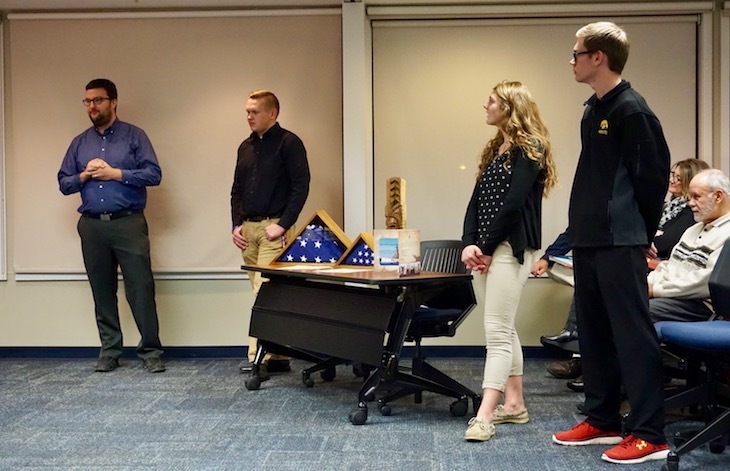 After the Board Meeting was called to order, Board President Cathy Dremel introduced BHS Band Director Chris Owen, who, along with three Batavia High School seniors, shared their experience from the Marching Band’s trip to Honolulu during Thanksgiving Break. 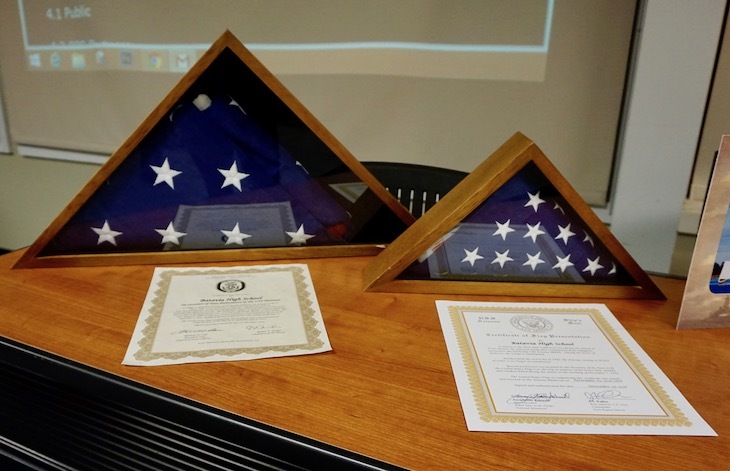 Mr. Owen also showed Board Members the two American flags and corresponding Certificates of Presentation that the BHS Marching Band received and brought back from their performance at Pearl Harbor. One of the flags flew over the battleship USS Arizona, which is the site where more than 2,400 lives were lost during the attack on Pearl Harbor, including BHS graduate (1935), Francis Alberovksy. 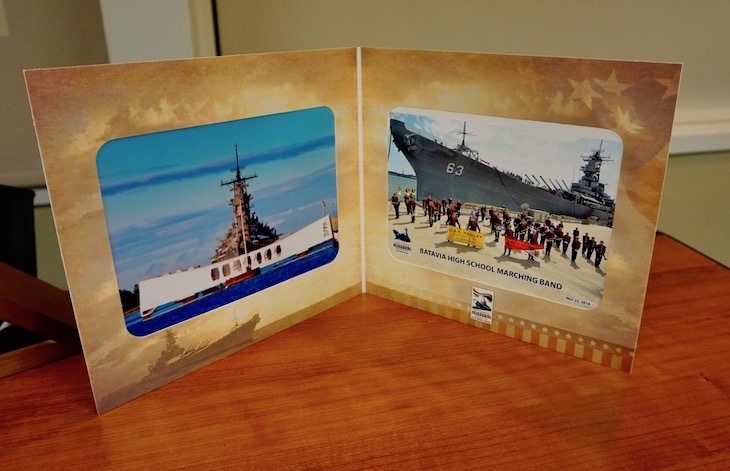 The other flag flew over the battleship USS Missouri, which was the site of the Sept. 2, 1945, signing of the “Instrument of Surrender” ending World War II. The Board of Education reviewed all stakeholder feedback on the 2017-18 Academic Calendar and approved the draft as presented. The first day of school for all students is Wed., August 16, 2017. View approved 2017-18 Academic Calendar. The Batavia High School Leadership Team is recommending that the Board of Education approve an administrative procedure at a January 2017 Board Meeting to eliminate class rank, beginning with the graduating class of 2019. The current system of “Highest Honors,” High Honors,” and “Honors” would remain in place. BHS Principal Dr. JoAnne Smith explained that elimination of class rank is not a unique idea. Many schools nationwide have adopted this practice, including benchmark high schools in the following districts: Geneva 304, St. Charles 303, Indian Prairie 204. Wheaton 200, Central 301, Huntley, Kaneland 302, Elmhurst 205, and Barrington 220. We value the practice of the Latin system and capped grade point average. This system has allowed students to take risks and courses they may not have taken without a penalty in their class rank or grade point average. This system also rewards students for those risks and achievement. We feel the average of three Honors or Advanced Placement (AP) courses per year (12 in their high school career) is a good benchmark for our students. We have seen not only seen an increase in AP course enrollment, but also an increase in AP test taking and scores. This may relieve some of the pressure or “game-playing” that may occur with class rank. Students separated by one-thousandth of a grade point could have very different class ranks. According to National Association for College Admission Counseling, class rank has played small role in student selection in recent years. Other factors are weighed more heavily. If a school does not publish a class rank, other factors are used for admission (such as course rigor, grade point average, involvement, and standardized test scores). View Board Docs for the actual updates. Tues., Jan. 10, 7 p.m.
Tues., Jan. 24, 7 p.m.
Tues., Feb. 7, 7 p.m.
Tues., Feb. 21, 7 p.m.